Rice it, mash it, roast it, blend it… the opportunities are endless! Learn how to cook cauliflower with these five kitchen techniques. Cauliflower is the unsung hero of the vegetable world, often overshadowed by its colorful and more commonly known counterpart: broccoli. However, over the past year or so, this humble vegetable has made a triumphant comeback and asserted its rightful spot in the cabbage family. With a sweet and slightly bitter flavor, cauliflower (aka “cabbage flower”) boasts impressive anticancer, antioxidant, antibiotic, and antiviral characteristics. But its real claim to fame? Versatility. We put this creamy white vegetable to the test by blending, chopping, mashing, roasting, baking, and grilling it. The results may just surprise you. You know those healthy takes on traditional dishes that end up tasting like cardboard and leaving you begging for the original? Well, cauliflower rice is not one of those. It’s a surprisingly delicious and easy way to sneak more veggies into your diet without sacrificing rice’s beloved texture and consistency. All you have to do is place cauliflower chunks in a food processor and pulse until broken down into rice-sized grains. Drizzle some oil or butter in a large skillet, stir in the “rice,” and season with salt and pepper. Cover and let cook for six to eight minutes before fluffing with a fork. We love to toss in fresh herbs for a pop of color, but feel free to dress it up however you want – or leave it as is, that works too! 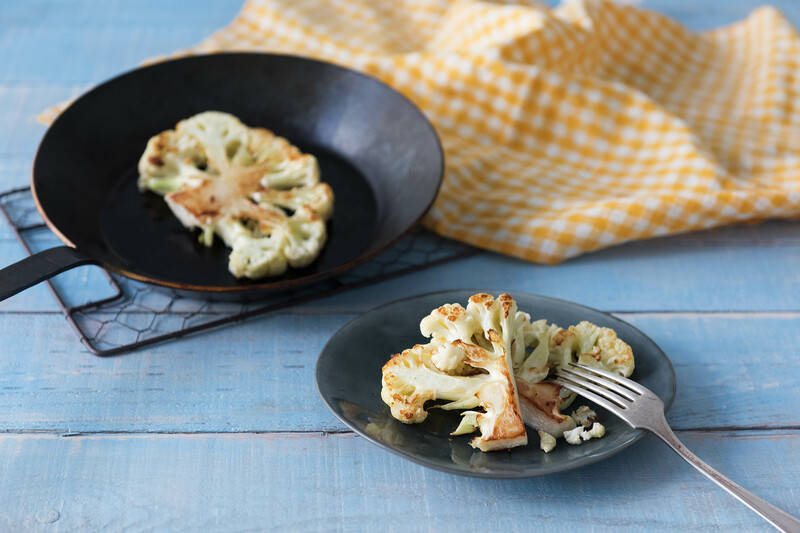 Let cauliflower take center stage at your next dinner by whipping up this veggie-centric dish. With a hearty texture, golden sear, and guiltless bite, it gives meat a run for its money. Cut a whole cauliflower vertically into four steaks. Drizzle with olive oil, season with salt and pepper, and place on a baking sheet. Roast in a preheated oven for 35-40 minutes, flipping once, until tender and golden brown on the edges. For a burst of flavor, serve the “steak” on a bed of herbed bulgur, top it with creamy Tzatziki, and sprinkle on some crunchy pepitas. Cauliflower combines well with other ingredients, which means it’s the perfect addition to chilled or warm soups. 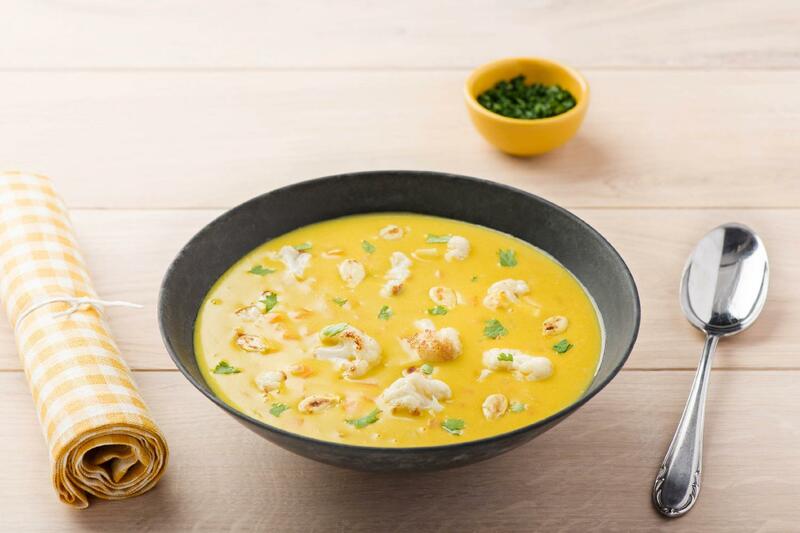 Although we may be getting ahead of ourselves here with fall flavors, the combination of nutty roasted cauliflower, creamy coconut milk, a touch of coriander, and a kick of cilantro is too good to ignore. And it’s easy, too! Get the recipe for our deliciously earthy soup. 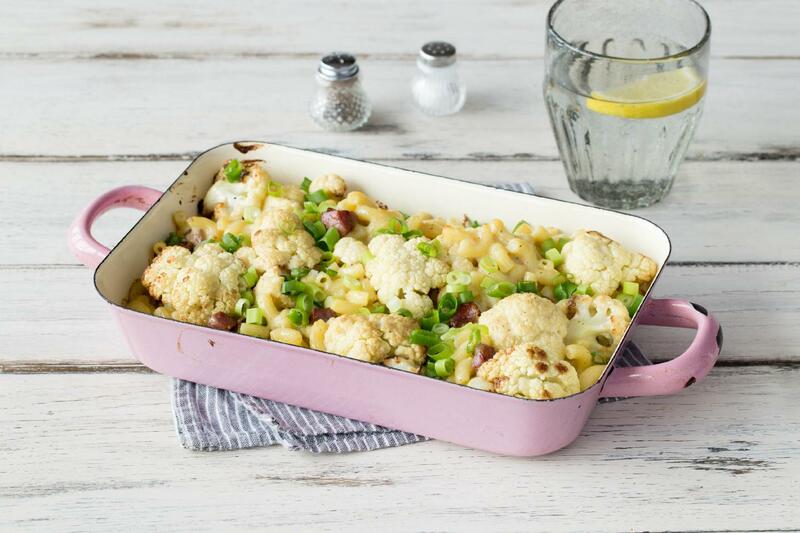 We know what you’re thinking… comfort food with veggies? Is that even possible? It absolutely is. Cut cauliflower into bite-sized florets and bake 20-25 minutes until golden brown and tender. Then, toss into a baking dish with pasta, creamy cheese sauce, scallions, and even a bit of pancetta if you’re feeling fancy. The vegetable lends a great flavor to this American classic while contributing a mighty nutritional boost. Cauliflower mash has the same comforting and creamy (read: dreamy) allure as starchy mashed potatoes. The only difference? It won’t sabotage your waistline. In fact, cauliflower is three times less carb-heavy and caloric as potatoes. To create this winning side dish, bring a large pot of water to a boil with a pinch of salt. Cut the cauliflower into bite-sized florets before adding them to the water. Cook until tender (about 8-10 minutes), drain, and return to the pot. Using a potato masher or a fork, mash the cauliflower in the pot until it’s as smooth as possible. Place over low heat and add butter, milk, and herbs. 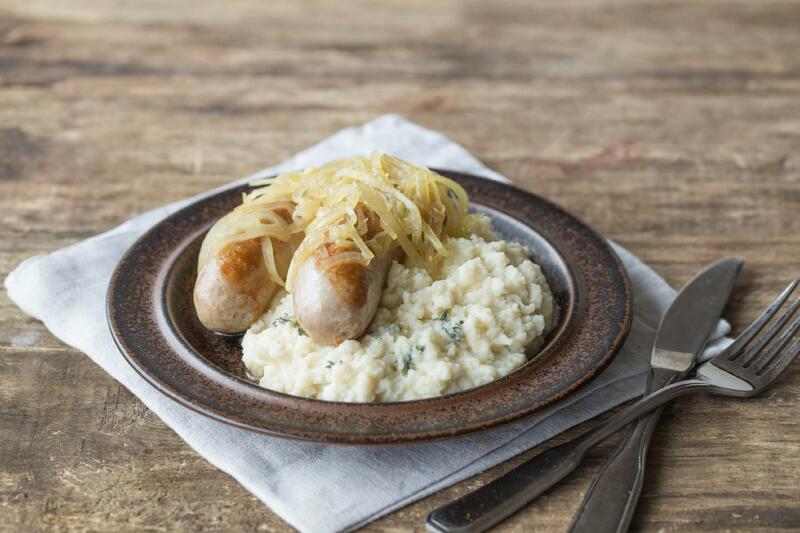 We’ve got a feeling you’re going to love pairing cauliflower mash with pork sausage and onion gravy. You know what cauliflower pairs well with no matter how it’s prepared? Turmeric. Get all the details about this super spice and start cooking! Improve the mashed cauliflower adding a couple of garlic cloves to the pot. In a food processor, pulse some cheddar cheese, then add the cauliflower, some salt and pepper and puree well. Bake for 25 minutes. Tips: Add carrots to give good color and flavor; boil them a bit longer. Thanks for the delicious tips, Rick!! I like to use pureed cauliflower as a sauce; you can season it with cumin and lay it on a plate and put a steak or croutons with red peppers; I use it as a base for sauteed scallops or shrimp. I mix it with tomatoes and basil and serve ravioli on it. That sounds delicious – thanks for sharing! Take a whole cauliflower, remove leaves, boil in water for 10 minutes – not fully cooked but somewhat soft. Cover crown liberally with Dijon mustard, and grate sharp cheddar cheese and cover mustard on crown. Pop in 400 degree oven 6- 10 minutes until cheese crown had turned brown. Remove, cut into quarters. – fantastic. Mary – that sounds amazing!! Thank you so much for sharing your delicious tip. I enjoy getting my fresh boxes every week. I wish there was a way to substitute dark meat for white meat. I really don’t like chicken thighs and would prefer chicken breasts in these certain recipes that require chicken. Thanks for letting us know! I’ll be sure to pass this along to our chefs. I like to roast cauliflower before mashing for a richer flavor. Mashed cauliflower is also excellent with half cauliflower / half sweet potato – the result is a beautiful golden color. Allie – The combination of cauliflower and sweet potato sounds AMAZING!!! I like to simmer my cauliflower in chicken broth with roasted garlic…then purée in process. Toss in a little whipped herb cheese lite..addictive !!! We’re also big fans of cooking with stock — it adds sooooo much flavor! That combined with the herb cheese sounds dreamy. Thanks for sharing! At what temp level do you cook the cauliflower “rice” in the skillet? 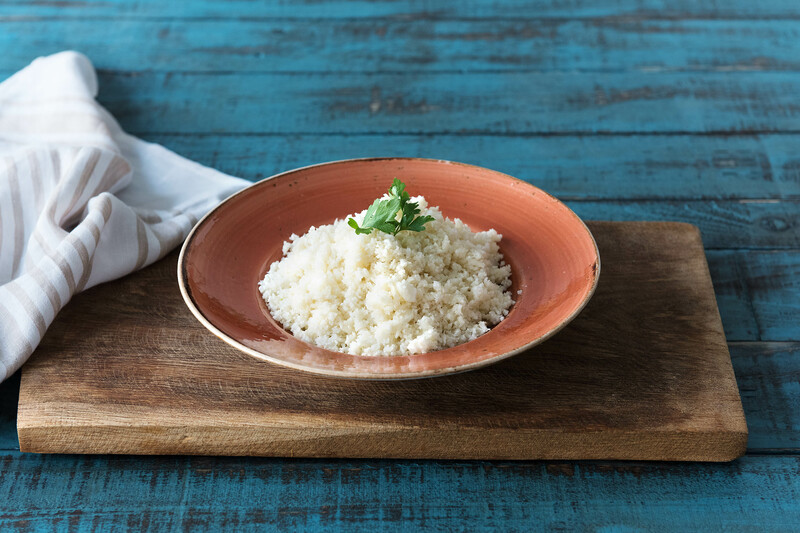 Hi Mara – cook the cauliflower “rice” over medium heat. What temperature for oven when making cauliflower steaks? Omg, always been a broccoli fan but WOW! I’m seriously contemplating cheating on him. I’ve noticed as I’ve I’ve gotten older and wiser, things that are better for myself and my 4 kids(I’m 47:) are slowly appealing to me in every which way. I don’t care if it’s evolution of DNA or the upside of technology and its perks, I’ll take it!!! That’s amazing! And trust us–we LOVE broccoli, too. 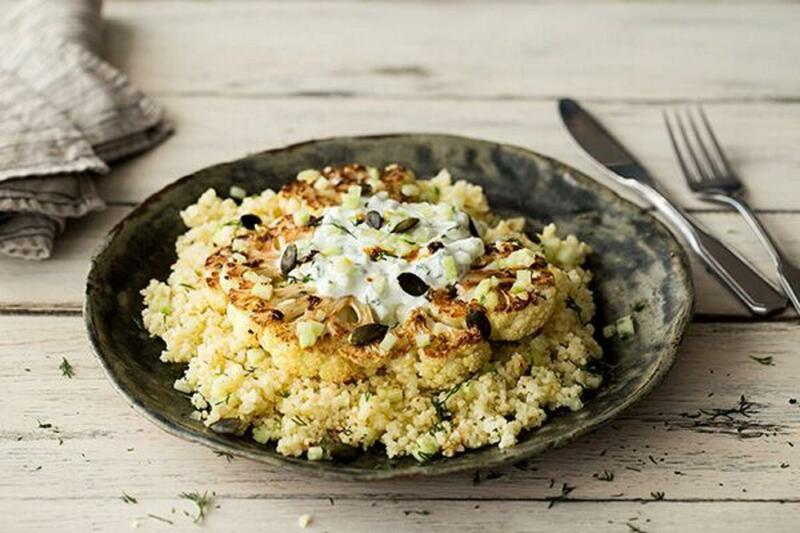 But these cauliflower recipes are TOO good not to try. Not long ago we ate our first cauliflower mash and it was great! My husband asks for it now. Who would have thought our tastes would change like that! Isn’t is funny what a little kitchen magic can do? Not long ago we ate our first cauliflower mash and loved it. My husband asks me for it all the time. Who would have thought we would grow up loving cauliflower! Gave Hello Fresh to my daughter-in- law , for her birthday. Wanted to make her busy work week easier. She and her husband love the meals. Best of all, her husband, has become the cook. He is not only enjoying the easy prep., he is so proud of each meal he presents to her, and sends us pictures of them.